"Kaththi" is one of the most awaited films of 2014. The action entertainer marks the second time collaboration of Vijay and Murugadoss after "Thuppakki". Vijay will be appearing in dual roles in the film, while Samantha plays the female lead for the first time opposite Ilayathalapathy. Bollywood actor Neil Nitin Mukesh appears as the baddie in the action film, while Sathish will be providing comic relief. Vijay, Samantha and 100 dancers will be shooting for the 'Selfie Pulla' song in Kaththi. The shooting of Vijay's "Kaththi" is completely wrapped up with the popular "Selfie Pulla" song being the last one to be shot. The song, crooned by Vijay, was shot in grand sets in a Mumbai studio. It appears that the film's trailer is also ready and director Murugadoss is expected to announce its release date soon. Anirudh has composed the soundtracks of "Kaththi", which has become a huge hit among the masses. The film is produced by Luca Productions and Ayngaran International. 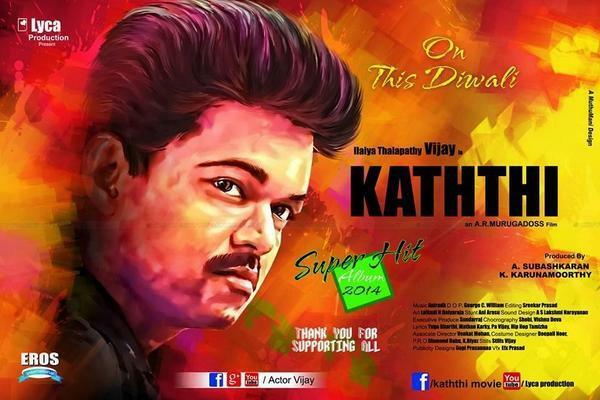 Vijay's Kaththi is all set for a Diwali release and already most bigger portions of the film has been completed. Also AR Murugadoss is working on VFX editing and other post production works at the same time while he directs too. The Vijay starrer is also expected to be dubbed in Telugu. The Telugu version might not hit the screens on the same day as the Tamil version and might get pushed to a different date. "Kaththi" is expected to clash with Vikram-Shankar's magnum opus "I," which is also being planned for Diwali release. However, there has been a buzz that "I" might not make it to theatres during the festival period. Even if the Vikram starrer fails to hit theatres for Diwali, "Kaththi" might still not enjoy a solo release as Vishal's "Poojai" is confirmed to hit the screens during the period. Besides the Vishal starrer, Shah Rukh Khan's "Happy New Year" is also slated for Diwali. The film will be released in Tamil and Telugu versions as well. Shah Rukh's last release "Chennai Express" turned out to be a huge hit at the box office. The film is expected to pose some threat to "Kaththi" at the box office.